One simple injection can save a cat's life. 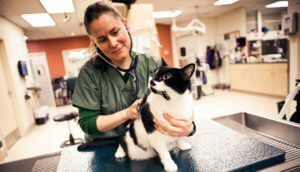 If your cat is experiencing symptoms including changes in behavior, changes in eating habits, weight loss, fever, rapid heartbeat, changes in litter box habits, shedding and diarrhea, they may have a condition called hyperthyroidism. Similar to humans, cats have a thyroid gland that regulates their metabolism. If the gland develops a tumor (almost all are non-cancerous), hyperthyroidism can occur. Untreated, this condition can be fatal. Our BluePearl veterinary specialists can diagnose this condition and treat your cat, often with a single injection. While the treatment does require that your cat stay in the hospital in a special ward for several days, we pamper her with music, food and loving attention.